1. What is the class and object of the class? 2. What difference between class definition and object of the class? 3. What is declared in the class? 4. What is called the fields of a class? 5. What are the C# language elements can be referred to member functions of a class? 6. What is the general form of class definition? 7. What are the types (modifiers) of access to the class members? 8. What access gives the modifier “protected internal“? 9. Can be missed the access type modifier when members of a class are declared? 10. Examples of simple classes declarations, that include data only. 11. How create the object (class instance)? 12. To which data types belong classes: to the type of value or reference types? 13. Example of class definition, which contains data and methods (functions). 14. Example of using an array of class objects and implementation the destructor in a class. 15. What features of use the keyword “this” in the class? A class is a template that determines the shape of the object. Classes are like types in a traditional programming language. The difference is that users can define new types in an object-oriented programming language. If a class is like a type in a traditional programming language, then an object is like a variable. Sometimes objects are referred to as instance of a class. Object class implements one of the possible variants of the class definition. When is defining an object of class the memory is allocated. When class is defined, the memory is not allocated. Is formed only description of the class members. Class definition is called the class declaration. In the description of the class are specified data and program code. 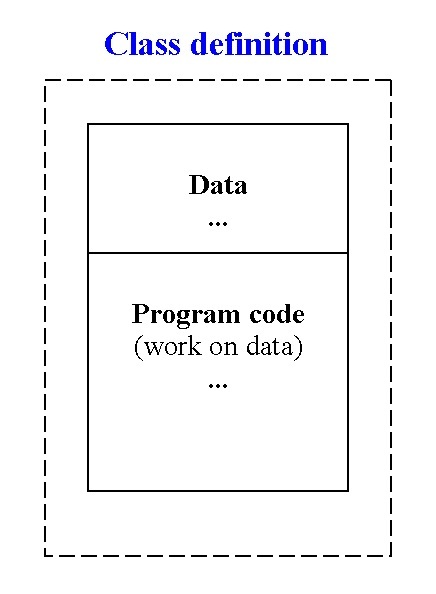 As a rule, the program code executes the some work under the data in the class (operates data in the class). 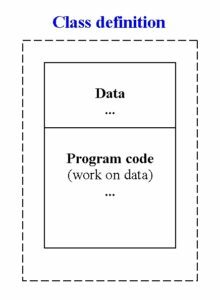 When class is defined, the memory for data and program code is not allocated. The class definition – this is an information about, what data are in this class, and what work is executed to these data. If the object of a class is defined, then, based on the class definition, the memory is allocated for this object. Thus class is a physical abstraction. Physically, the class will be represented only after the description of the object of class. When class is defined then data of this class are declared. Also is declared a program code which operates these data. Also, a class can define only data or only the program code. But when you are working with the classes then the most classes define the data and a program code. Data are encapsulated in the data members, which are defined in the class, but a code – in the member-functions. In C # are supported several types of data members and member functions. 4. What is called the field of a class? The data members are called the fields of class. The variables of the class instance and static variables are the data members. Class fields can be any valid type in the application. 5. What are the C # language elements can be referred to member functions of a class? // Declaring of variables of class instance. access – this is an access type. The C# language provides four access modifiers: public (public class member); private (private member of the class); protected (protected class member) and internal. The internal modifier defines the accessibility of class member in the all members of the assembly and its availability outside the assembly. parameters – the parameters of methods that are defined in the class. protected internal – this is a combination of the protected and internal modifiers using the logical operation “OR”. Such a member of the class is accessed within the class as well as in the inherited class. An inherited class can be placed in the same assembly or even in a different assembly. The paired access identifier “protected internal” consists of two separate modifiers “protected” and “internal“. This access level may be used only for the class members. The class member, that is declared as “protected internal“, is accessible only in the boundaries of it’s own assembly (internal) or it is accessible for the derived classes or types (protected). Answer: yes, it can be missed. In this case, the declared class member is private by default. Example 1. Class that includes only data. In this example, the new type MyPoint is created. The public class MyPoint is declared. This class defines a point on the coordinate plane. Example 2. Definition of class MyBook, that describes data about a book. After class declaration the new type is created. In the previous paragraph the MyPoint type is created. The class object is defined as a regular variable of the some type. Example 1. 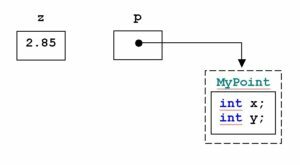 Creating the object of MyPoint type (see previously paragraph). Way 1. 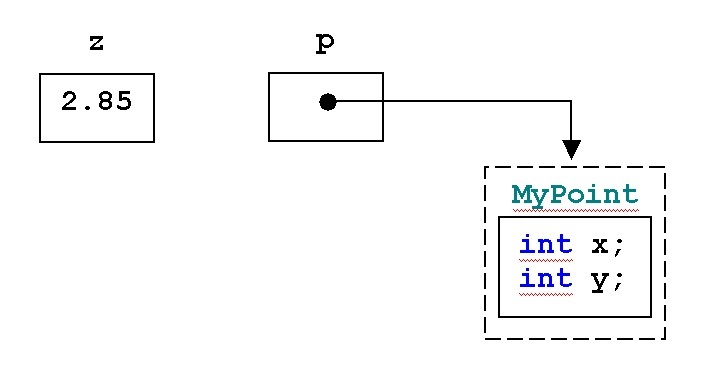 Creating of the object of MyPoint type with name p.
Example 2. Creating the class instance of MyBook type (see the previous paragraph) with name b. Classes belong to the reference types. The difference between reference types and value types is that the variable of value type contains a value. And variable of reference type contains the reference to the object (but doesn’t this object). In the given example, the address of created class instance in the memory is put to the variable p. The next figure shows the schematic difference between reference types and value types. You can do some work above data in the class. It is realized by using a member functions. In the next code snippets are described the classes with their own functions. function SetY(), which sets the y coordinate to the new value. The internal variables x and y of the class are declared as private. In the example below, are created two classes. First from their is of MyBook type. Second – array of books MyBooks. In class MyBooks is declared the destructor. // The internal method, that returns a book that given by the index. When the class object is defined, the all members of this object get implicitly the reference “this“, which is the reference to this object. Example. Declaration of the class DemoThis. There are two fields in the class. One of them is as private and is type “int” and is named “i“. The second field is public, it is of “double” type and named “d“. Two methods GetI1() and GetI2() are declared in the class. These methods return the value of field “i“. These methods do the same work, but access to the field “i” is realized differently. The same applies to GetD1() and GetD2(). In the class constructor DemoThis(int, double), that takes two parameters, the keyword “this” used for access to the fields i and d of class. This is due to the fact that the local parameters, that are variables of the constructor with the same names (i and d), hide the data members of declared class. i = 0; // without the word "this"
this.d = 0.00; // by using "this"
// The given constructor demonstrates the benefit of using keyword "this". // returning from the method without using "this"
return d; // without reference "this"
return this.d; // using the reference "this"
Previous PostControlling the displaying of the current time in the program. Example of demonstration of Timer componentNext PostThe implementation of the concepts of “inheritance” and “polymorphism” in the object-oriented programming through the creation of two classes. The interfaces ICloneable and IEquatable.